I’ve added RSS feeds from blogs about librarians, data, and data visualization to Feedly recently, which I was going through the other evening. When I came across this particular picture, though, I paused. Are we polling slaves? Or how else did a polling company make statistics for a hidden population? Who are all these people in ‘other’ countries? What’s our definition of a ‘slave’? Do trafficked Americans count? Who made this estimate, and why? And where’s the context that would make sense of this data? When I say context, I’m thinking of… number of slaves per citizen, percentage of migrants who are trafficked into a country, income inequality between landlords and the poor, or a comparison to historical trends. Yes, I know that’s not what pretty data infographics are for. Dadaviz is eye-candy for busy people like me. And yet, that slave graphic raised more questions than it solved. So I’d like to dig a little deeper… and maybe increase our own data literacy (yeah, that’s librarian-speak for “using numbers and their sources wisely”) in the process. First off, I know that India, China, and Pakistan are some of the most populated countries in the world, while other countries chock-full of people don’t make this list. Why? This has me wondering if anyone’s looked at number of slaves compared to the population. I can’t easily find the source of this data on the endlessly scrolling blog… but finally I find hidden dots in the corner. Oh yes. That’s it. They raise several factors–but don’t really discuss migration. My thought at this point is that we can’t look at population without migration. Slaves in Russia are likely migrants from Central Asia; slaves in Bahrain may be from India or poorer parts of the middle east. Slavery is justified because someone comes from ‘outside’, whether by class, income, ethnicity, place of birth, or race (I’m thinking of Graeber‘s Debt, a book I’ve summarized here). This means that some slaves may not be citizens of the country they inhabit–so how do we estimate their number, and their relation to the ‘official’ population numbers? So where are these numbers from? “face to face interviews with 8,061 adults, aged 15 and older, conducted in May and June 2014 in Brazil, Ethiopia, Indonesia, Nepal, Nigeria, Pakistan and Russia” (Gallup). I wondered why they didn’t interview in India, the runaway slaveholding state. Were countries chosen because they were easier? Because people were vulnerable to what? In sum, Gallup and Walk Free interviewed 8,000 people in 7 countries to learn about possibly slavery in their family networks. There’s a lot of good stuff in the full report, which you can read on your own, but I’d like to focus again on the data visualizations. This suggests 2.1 million slaves in Pakistan, or 1.1% of the population. UN population prospects note 173 million Pakistanis in 2010 (.xls); there are some 189 million today (Wikipedia, via population clock). 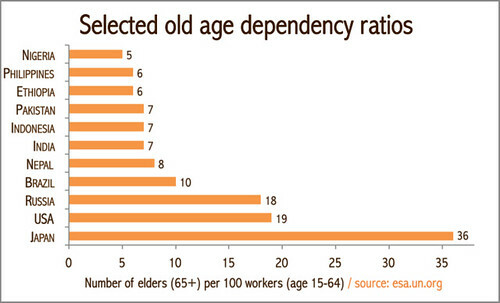 I’m not seeing any trend here of slaves being in old-age states, which was my casual hypothesis. Japan… well, Japan is a whole separate issue. Both have their strengths and weaknesses. 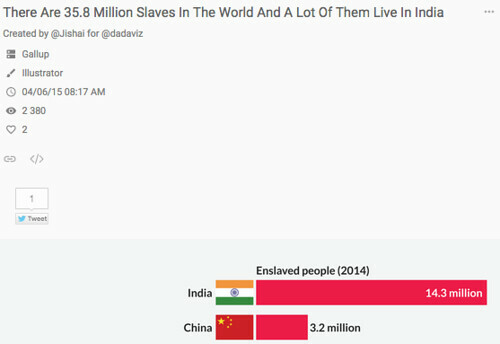 In the very first chart by @Jishai, note how India’s fourteen million slaves jump out. The bright numbers look high, with millions of people enslaved in India, China, and Pakistan. It’s simple and effective… although it leaves out a lot of detail or obvious links to context. But in Gallup’s graph, similar numbers look low: only 1.1% of the population, 2.1 of …something. There’s more data, but it’s not better displayed. I find it disorienting to see percentages and millions of people graphed side by side. So in this case I’m not sure which is better. As with any data visualization, the authors are making decisions: which facts are important? what do we highlight and what do we downplay? what emotions or decisions do we want people to walk away with? 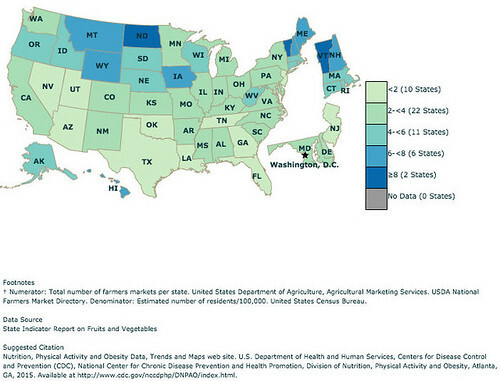 There’s a lot I like in the chart above: more farmers markets mean a darker state; the data source and citation are clearly shown; small states are highlighted so you can see them better. After playing around in Illustrator, he’s made it easier to read. I clearly see which states have the most farmer’s markets per capita (seems to be rural and low-population states), and I love that it’s laid against a subtle national average line. A small farmer reinforces what the graph is about. Comments or visualizations of your own? Comment below, or tweet at @celiemme. Gallup’s side-by-side column chart of prevalence and population by country suggests that as prevalence decreases, so does the modern-slave population. This would be a tautology if these countries all had the same total population. By omitting Pakistan, China and India, Gallup’a graph suppressed the outliers. A better graph would be an XY plot of prevalence versus slave population. India would clearly be seen as the “leader” on both scales with Pakistan as #2 in prevalence. 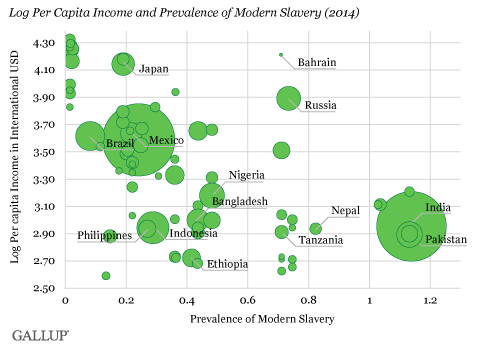 Unfortunately, none of the graphs provide any causal insight as to why India, Pakistan and Nepal have the highest prevalence of modern slaves. Thanks for your comments, Milo — I think you’re right that these graphs aren’t giving the full picture. Gallup’s report may have more information, but it’s not going to be circulated and shared as easily.